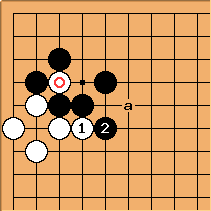 This joseki is one used by Sakata. Cutting at is more popular than cutting at first, which involves a ladder. 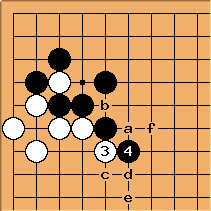 The joseki ends here, but there is plenty of subsequent interest. 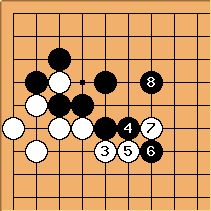 White will want to avoid Black at a, if at all possible. White at 1 here was an old, perhaps forgotten move, when Fujisawa Hideyuki played it in game 1 of the first Kisei match. It is now frequently seen. If White pushes up at 1, which is normal, Black can play at 2 for a pushing battle, or duck the issue at a. 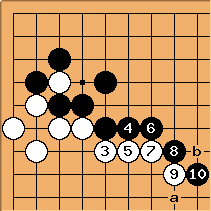 If Black plays tenuki, which is possible too, White can play at a herself. 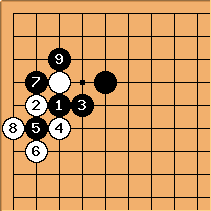 If Black lets the corner become too weak, the aji of White's marked stone may be activated. This example turns out to pose a problem for those who'd like to theorise about pushing battles. The big question is always: hane or extend. As the pros play it, there is no fixed local way to make the decision. Black can play 4 right after White 3, with an expected continuation White a- Black f.
This is what one expects Black to play in a focal part of the board - when gaining one line of territory also takes one line from the opponent's framework. White can fight with White f rather than White e, always depending on the neighbouring positions. Black can wait to play hane. In this case Black perhaps anticipates the cut and has the table shape answer prepared. This happened for example in Sakata vs. Ohira Shuzo 1973-01-16 (Nihon Ki-in Championship Final game 3). 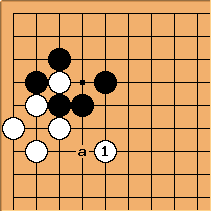 If Black wants influence and little chance for White to cut, there is this way (then White a, Black b), from a game Kudo Norio-Takemiya Masaki. Which is though gote for Black.